The main idea of this post is to encourage you to develop a media asset that you own, that’s also an attention asset. This blog post shows you the business model for doing so. Is Facebook Really Worth Buying A “Facebook Secrets” Product For? I know some people are confused about how to use Facebook for business. But I think I can explain that to you right now. You have to create a relevant following. You’ve got to deliver the value that goes beyond your own stuff, your own content, your own products and services, ect. Because when you do share relevant content, and you share your own, your content is going to spread – at least a little bit. If you consistently tell a true story about your company, product, service, or idea that resonates with the worldview of a group of people, that “world” will eventually beat a path to your door. Early to rise is a direct marketing company in a few different niches like Internet and Direct Marketing, Investing, Business Building, Career Advancement, Goal Setting. 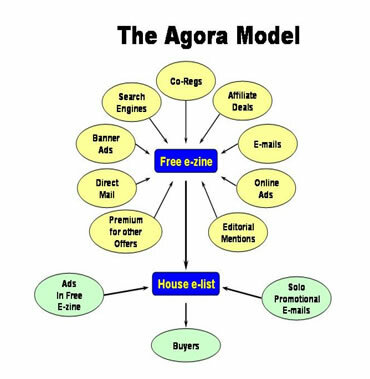 They use the “Agora” business model. Newsflash: You’re a direct marketer. People are looking for the latest “trick” or they fluff off an idea as “Yeah I already know that and it didn’t work,” but this model is so simple besides Early To Rise markets the heck out of it and it works like gangbusters. Instead of free ezine being in the middle, put your blog in the middle, and everything that satellites free ezine is social media and other forms of traffic. Where it says “house e-list” … that’s your email list. The web has always been social. It’s a communications medium between people. The tools we have now have made it even more social. Things can spread when people spread them. Now we have relationships that start in blog comments or they start on Twitter or they start on Facebook and then you ask them for a favor or, more likely, you put out something good and they’re just going to share it because sharing content is people do on the web, right? If you direct people to good stuff they will keep coming back to you for more good stuff. How about sneaking in a few of your best blog posts? The reason why you want to focus on content is because you want to build attention assets. Blogs are the original social media and now blogging has grown up to where you have these interactive, plugged in platforms. You have your blog or platform or flagship website in the middle (your hub), and then you’ve got Twitter, and Facebook, and YouTube, and the rest as satellites (outposts) that feed you traffic. People who don’t have the hub in the middle are missing a huge component. That’s why you need a blog. You don’t own Facebook or YouTube or Twitter or Google Plus. You don’t own the company replicated site. It can all be taken away from you. The rules get changed. I am a direct Marketer, really? haha, I’ve doing direct marketing for the last few years in the traditional corporate environment and yes even if a lot of the interaction is happening online, the best part of your business will come from your own list. Thes comments in this blog are fabulous. You are so right about the need to focus on content and the fact that you don’t own facebook etc. Judging by the number of mothers setting up businesses blogging the power of the blog is obvious. It can also make local authorities change their minds quickly due to worldwide pressure, resulting from blogs. The nine year old girl in Lochgilphead Scoltand set out to raise enought for a school kitchen in Malawi. Her blog about her school meals got so many hits she has raised enough for 5 kitchens. Great information Eric you are right that every marketing system need a hub to start with aka your blog or website the Renegade blog is awesome I read it every day keep up the great work Eric.